Capitanejo, Guaraguao, Guayabal and Rio Cañas Arriba are rural barrios in Juana Díaz, Puerto Rico (PR) which are served through a USDA-RD Solid Waste Grant. Since the fall of 2014 RCAP Solutions has provided technical assistance to overcome one of the most noticeable problems in these communities: the improper disposal of solid waste. 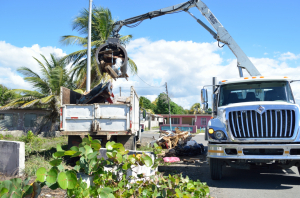 Even when the municipality provides services such as weekly trash collection and monthly or bimonthly debris removal, many community residents do not participate in these initiatives to reduce solid waste generation. This demonstrates a current lack of interest or knowledge about how to solve their mounting solid waste disposal situation. The most probable reason for this behavior is a lack of environmental education and a low level of awareness of both the problem and its short and long term consequences. Limited resources and an emphasis on funding and support in urban areas make it challenging to educate and assist rural residents. Important government supported initiatives like the Single Use Plastics Bag Ban (PR ACT 247), which went into effect on December 31, 2016 are very important because they pique the interest of not just urban but also rural communities. 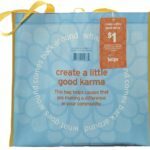 RCAP has conducted eight workshops this year about the reasoning behind the passage of the “Plastic Bag Ban” in rural community schools to educate both students and teachers. They have learned the importance of this act and how they will benefit in terms of their health and the improvement of the surrounding natural environment. 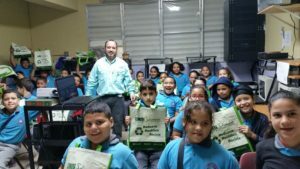 The main goal of the initiative and RCAPs work around Solid Waste in PR is to initiate a process in which reduce, reuse and recycle can be a part of the local culture. A change in adult behavior can be promoted through the education of their children concerning solid waste problems and simple, affordable solutions. The kids have and will continue to assist RCAP in its efforts to modify the community’s learned bad habits and transform them into new positive ones. Prof. Juan Cesari Delgado, Director of Capitenejo School. Collores is one of the most named barrios in Juana Díaz PR. It was the birth place of poet Luis Llorens Torres, one of the most important journalists of the first decades in the 20th century in PR. As a lawyer, playwright, politician and poet, he was responsible for the immortalization of the beauty of the rural areas of Collores in his writings. But in recent decades some of the beauty of “El Valle de Collores” was lost as a result of poor management of the solid waste. Due to the collaborative strategy and the efforts between the “Solid Waste Taskforce” members and the communities, we can appreciate a positive change. The Natural Resources Department contacted RCAP to refer a situation with the establishment of an illegal dumping site in the Agustinillo Sector at the road 512 km 4.2. The place near the river is been used for the accumulation of solid waste for future pickup by the municipality. Using the information in the RCAP solid waste brochure published in the community newspaper, some residents called the DRNA Vigilant Corp. to complain about the problem. The lieutenant in charge, looking for a more proactive way to deal with the situation, oriented the residents in the sector and some interviews were made by RCAP TAP. With the assistance of the DRNA the residents were oriented about the consequences of that practice for the environment, the river and their health, also the legal penalties associated with the intervention from the DRNA and the police. The community ceases the practice and contacted the municipality officers for the collection with the information provided during our intervention. TAP call the Juana Díaz DTOP Director to let him know about the situation and coordinate the removal of the materials. The DRNA on their part contacted JD DTOP to require action on the collection of the materials. The municipality took action immediately. With the participation of residents of the Agustinillo sector, TAP performed a cleaning and restoration of the area used for illegal dumping. 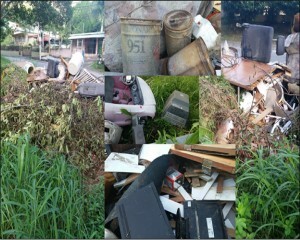 The small illegal dumping site in progress was stopped and eliminated. The place was programed for the developing of a land scape that will be adopted by community members. Community groups such as; the Colectivo Valle de Collores, were involved in the process and additional members of other sectors will be contributing with the design of a landscape. The DRNA donated endemic bushes for the place. The activity was reported to the Regional Offices of DRNA and all stakeholders, as a result of this, the State Department of Transportation and Public Works collaborated with the initiative and invited the community to their nursery for orientation and selection of other ornamental plants. The adoption of the area is going to be made formally by DTOP. The residents are in the process of developing a project in which they can integrate food crops and ornamentals in the area in order to address the interest of residents with different interests. Some banana trees were planted in the background as suggested by the some of them. The PR Natural Resources Department Vigilant Corp was present on the cleanup and the possible violators of the law were identified for orientation about the situation and the possible repercussions of their behavior. 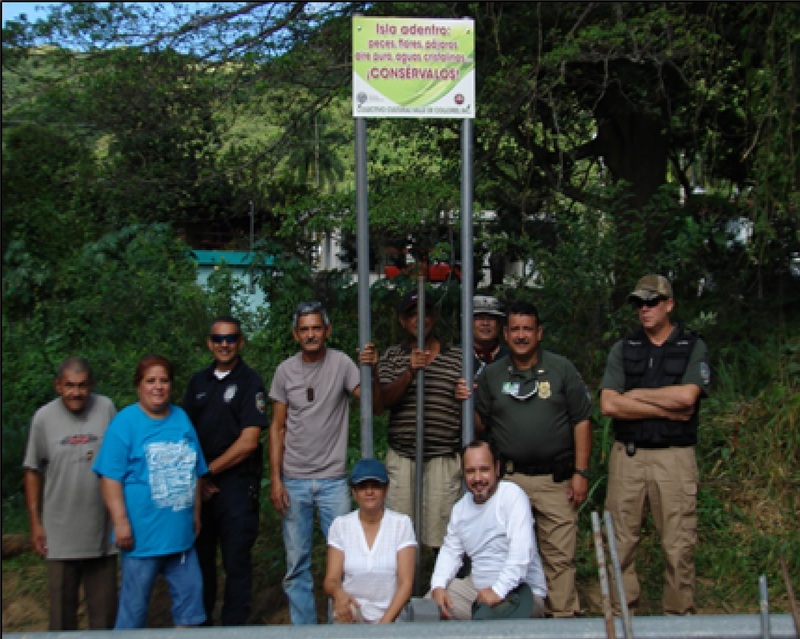 A sign donated by Colectivo Valle de Collores was placed in the area with a positive message: “ Isla Adentro: peces, flores, pájaros, aire puro, aguas cristalinas… Consérvalos. (Inside Island: fish, flowers, birds, pure air, crystal clear waters…Preserve it). After a few months the place remains clean and the donated plants are in the area waiting for the final design and the top soil conditioning. Collores is going back to be the idyllic place nostalgically described by one of its favorite sons; who immortalized its rural beauty before the solid waste were part of the scene. Thanks to the team work of the taskforce created by RCAP and the community support Collores is changing for good; the empowerment of the community is taking place in the solid waste management and we are convinced of the success of or approach. As the snow storm winds down here in Central MA, we thought it appropriate to share a video made recently about the clean-up efforts RCAP is spearheading in Puerto Rico. 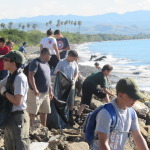 This video shows the tremendous support shown by the community, resulting in over 400 volunteers coming together in the poor, rural barrio of Manzanillo, to clean a beach destroyed by illegal dumping. 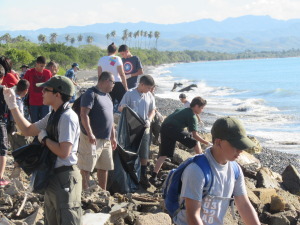 Our second annual clean-up will take place in just a few weeks in Guayabal, a similar area just a few miles away. Manzanillo is a small, poor, rural barrio located on the southern coast of Puerto Rico, where the Jacaguas River meets the Caribbean Sea. Manzanillo, like much of Puerto Rico, faces significant challenges with solidwaste management and illegal dumping, but for Manzanillo the problem is magnified because the debris is washed into the river and ocean only to be returned to the beach and into the community during the all too common flood events in the area. That continuous cycle of pollution, combined with the limited budgets and personnel, made the goal of cleanup seem almost out of reach. 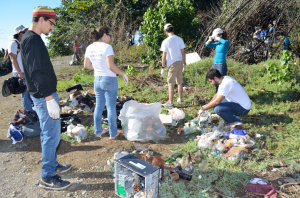 Recognizing the need for a comprehensive solution, RCAP Solutions partnered with the Solid Waste Authority of Puerto Rico and the Puerto Rico Department of Natural Resources to form a community coalition with the goal of cleaning up Manzanillo. 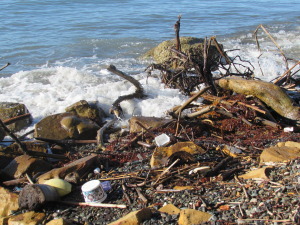 An example of the waste dumped along the beach. 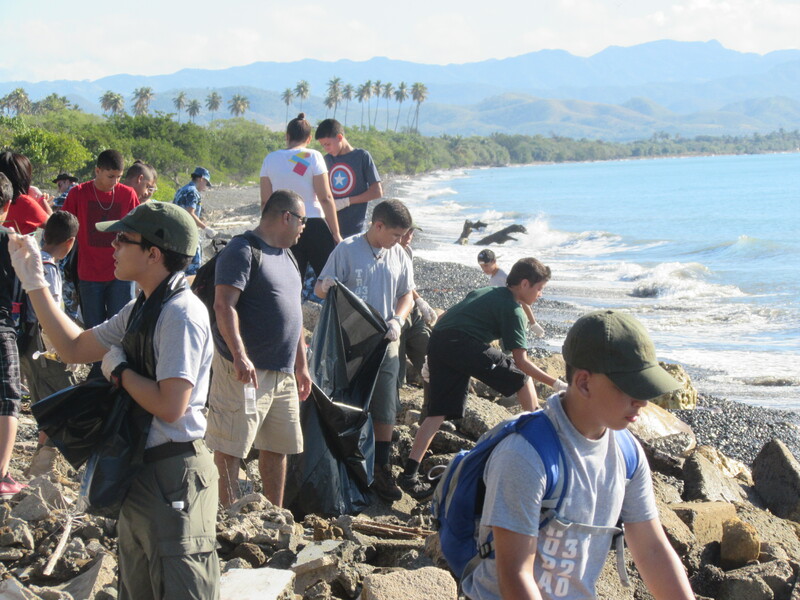 The initiative attracted a wide range of participants, including the state and local police, local government officials, students from the University of Puerto Rico in Ponce, high school students, teachers, Boy Scout and Cub Scout troops, church groups, and a number of other people concerned with the condition of the neighborhood and its beaches. In total, over 400 volunteers took part in the event, which took place in January, 2015 and which resulted in 15 truckloads of trash – approximately 100 cubic yards – hauled away. Large numbers of volunteers working along the rocky coast. Edwin and his RCAP Solutions staff trained volunteers on how to handle waste and hazardous materials. Participants were given gloves, bags, and tracking sheets to map the volume, type, and location of the waste materials. The volunteers were also provided with educational information on recycling, water and wildlife conservation, and illegal dumping and burning. The residents of the area not only gave their time, but also donated prepared snacks, drinks, and home cooked meals to volunteers throughout the course of the cleanup. Following the event, state police officers dressed in clown costumes, set up bounce houses, and provided face painting and other entertainment for the local children. Volunteers fill trash bags during the clean up. 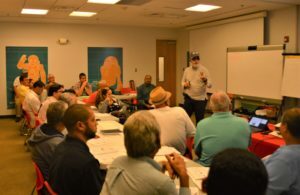 Following up on the success of the event, in March, RCAP Solutions offered a workshop focused on the creative re-use of recyclable and found objects, such as repurposing plastic containers were as pots for vegetables and using toilet paper and paper towel rolls as seed pots for plants in community gardens. School children and their parents raised the plants with their parents, and the plants were targeted for use in the restoration of the problem areas. 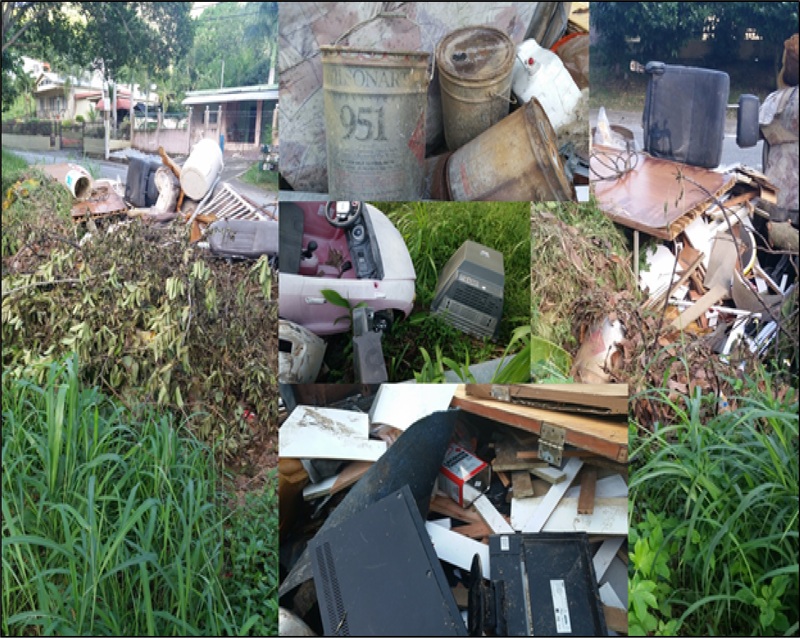 RCAP Solutions is continuing to research additional strategies that will add value to the areas that were cleaned and recovered from illegal dumping. These include the creation of a land adoption program, where local businesses and community groups take ownership of the landscaping and continued maintenance of public area. 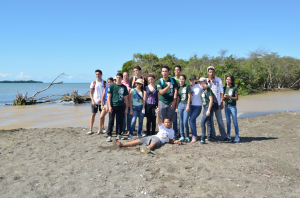 Volunteers proudly pose on the clean beach, post clean-up. Cleaning an area like Manzanillo is a just a first step toward solving the significant solid waste issue in Puerto Rico. According to the U.S. Environmental Protection Agency (EPA), the problem has reached crisis levels. The island generates more waste per person than the mainland and anywhere else in the Caribbean. Although 55% of Puerto Rico’s waste stream is considered recyclable, current recycling rates are between 7-10%, well below the island’s official goal of 35%, and largely limited to urban areas. There are very few drop-off locations, which makes recycling, even for the highly motivated, quite difficult. There is also no “bottle bill” in Puerto Rico. Illegal dumping is common, and littering is endemic. Most of the landfills on the island are non-compliant. Most rural communities have “transfer sites” which consist of unenclosed dumpsters located on the dirt shoulders of major roads. These sites allow leachates into the aquifers and major rivers that run parallel to the roads and serve as water sources for downstream communities. Trucks are loaded withn trash, to be hauled away. Large items, such as tires and refrigerators, act as reservoirs for rainwater and provide a breeding ground for disease vectors like mosquitoes and rats. An outbreak of Dengue Hemorrhagic Fever in 1994 and 1995, resulting in 4,660 hospitalizations and 40 deaths, was largely attributed poor waste management practices, insufficient infrastructure, illegal dumping, and polluted cisterns. More recently, Chikungunya, a mosquito transmitted disease causing fever and intense joint pain, has been spreading throughout the Caribbean. The virus alone is seldom fatal, but the symptoms can be severe and disabling. Chikungunya is common in Africa, the Indian subcontinent, and Southeast Asia, but recent outbreaks have spread the disease over a wider range. In December 2013, Chikungunya was confirmed on the Caribbean island of St. Martin, and as of October 2014 there have been 18,109 suspected cases of Chikungunya in Puerto Rico, according to the Puerto Rico Department of Health. 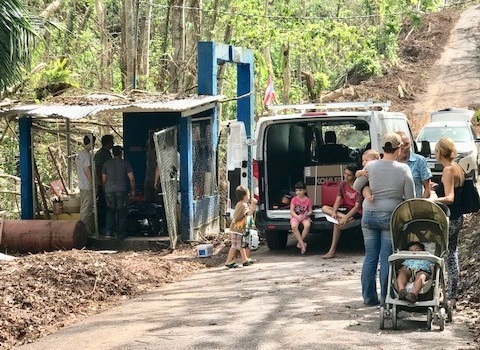 Puerto Rico also faces numerous barriers that make it difficult for communities and the government to implement solid waste reduction initiatives. These include a lack of infrastructure, economics, startup costs, cultural issues, and a lack of capacity. 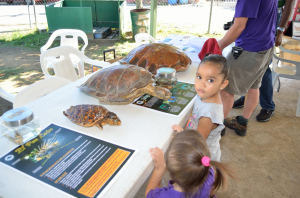 The youngest members of the community learn about water and wildlife conservation. From an economic perspective, low income rural communities do not have the resources to experiment with solid waste reduction systems, and most citizens see municipal solid waste services as a “free service.” There is little utilization of unit-based pricing to incentivize waste reduction/recycling and the infrastructure is not yet in place to provide for these types of systems. The only current economic mechanisms in place that could incentivize citizens to recycle are the tipping fees at the landfills. However, the fees across the island are low and do not reflect the true cost of landfill disposal. In Puerto Rico, tipping fees average $30/ton, whereas in the Northeastern part of the United States tipping fees average over $70/ton. Also, many believe that increasing tipping fees and initiating unit-based pricing schemes will result in an increase in illegal dumping. The only other economic incentives for communities are noncompliance fees. However, most communities, if fined, do not have any means of paying the fines. In lieu of payment, the EPA has instead been requiring communities to develop and implement improvement plans. These communities have limited technical staff available for waste reduction, as well as for operator training, and there is a significant level of need to increase the technical assistance capacity. There is a significant need to provide training and technical assistance for planning, financing, managing, and conducting the community education necessary to develop and operate a successful waste reduction program. 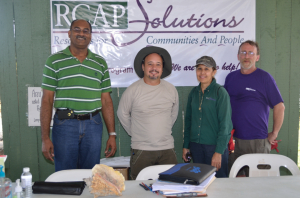 RCAP Solutions staff members: Juan Campos-Collazo, Edwin Vazquez-Asencio, Josefa Torres-Olivo, and John Linehan. RCAP Solutions has stepped in to try to address many of these issues with a grant from USDA Rural Development that began in October of 2014. 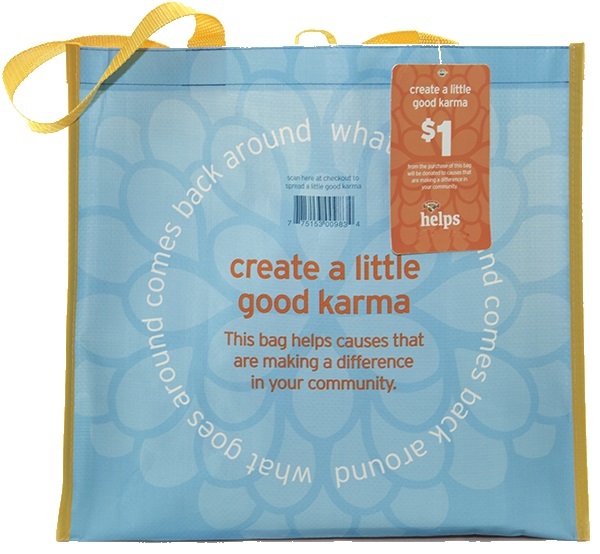 Specifically, the goals are to promote reduction, re-use, and recycling through community recycling programs; plan and implement waste reduction programming; promote the elimination/reduction of illegal dumping sites; and promote collaborative and regionalized approaches that can help address cost barriers and achieve economies of scale in solid waste reduction efforts. 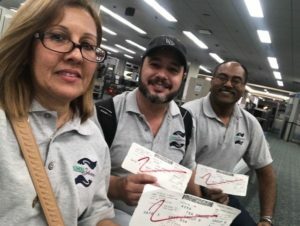 While Puerto Rico faces a daunting task in tackling its solid waste issues, the problem must be met at the community level. Manzanillo was an example of what can be done when a community has the leadership and cooperation needed to succeed. 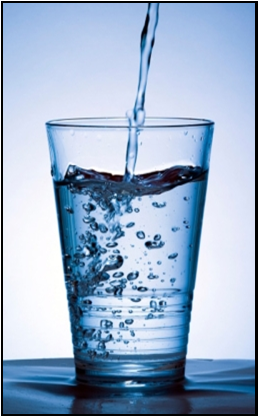 RCAP Solutions will provide a free training (in Spanish) on proper management of private water wells on July 22, at Juana Diaz municipality in Puerto Rico. The workshop is geared for those who have private wells for drinking water (business, residence, farmers, ranchers, etc.) or anyone who may want to gain knowledge on this topic. This training is aimed at providing guidance on individual water wells. It will be an excellent opportunity to engage the panel of experts on: wells for drinking water, proper management and water quality guidelines, conservation and potential sources of contamination. Sponsored by US EPA. For additional information see the links below. To register, contact Edwin Vazquez : evazquez-asencio@rcapsolutions.org or (787) 725-6523.